The repair of collapsed Krukut River's sheet pile as long as 20 meters around Tendean Square stores some time ago has yet to be done. Repair could be done after river dredging at the location is completed.
" 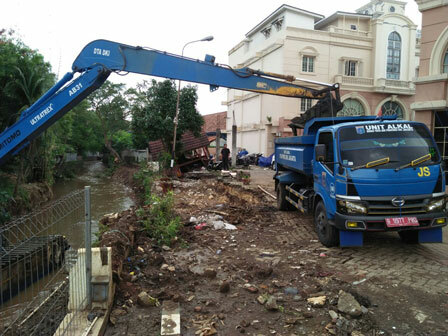 We do this to smoothen dredging process against Tendean Square towards Petogogan upstream"
Firmansyah, Section Head of Maintenance, South Jakarta Water Resources Sub-dept. said the river is still being dredged. Thus street on the side of the sheet pile had to be used as entrance access for heavy equipment. "We do this to smoothen dredging process against Tendean Square towards Petogogan upstream," he expressed, Saturday (1/27). Due to this condition, the sheet pile cannot withstand the burden of the equipment and collapsed up to 20 meters long. "Sheet pile is also burdened by building panel walls that should not be on top of it," he told. So, the repair itself will be executed after dredging is completed. He added repair would also be done on all parts of the plaster that is now conditioned on italics. "We do this to prevent unwanted things in future," he stated.